The death penalty had Christ killed. And that was a case of someone innocent being killed. Hey, that was God sacrificing himself. Don't suppose anyone here wants to have a go ? edit: But would you view it as a 'just' execution ? To be particular, someone giving up (sacrificing) their life isn't the same as killing (sacrificing) themselves. But otherwise, I hear what you're saying. Capital punishing is a just penalty in life-for-life. Whether punishments can be appropriately measured out is another thing. I'd add that Christian soteriology can't be applied to social law, they're two different things. As for governing of a society, I don't have much faith in humanity, yet whatever restrains evil while increasing the good ought to be endorsed. God's principals always trump man's laws. There are always unjust laws. E.g in many communist regimes, it is unlawful to read/preach the bible or pray publicly, but people do break these laws often and get punished. Should they obey it because the bible says so? I am not sure entirely. The accused, Mr. Homo PossibleKillis has fronted the court on a charge of 1st degree murder. The evidence presented was based on the testimony of one witness - Mr. Homo Dubious, who himself has a string of multiple convictions related to attempted murder. According to state and federal law, if an accused is found guilty of 1st degree murder, he is to be executed by an appointed executioner but there is also a provision in the law for the judge to leave it up to the discretion of a Jury panel on whether or not the criminal is to be executed. Presiding Judge, J.C. VendingMachine has, based on the evidence, found the accused guilty of 1st degree Murder but has left the sentencing and possible execution to be determined and carried out by a jury panel consisting of GodandScience forum posters. Panel Deliberates........Should we execute him ? Yes - Jesus said you reap what you sow, murderers have sown their own fate. No - Jesus says we should show love, mercy and turn the other cheek. Yes - God has instructed society to put a murderer to death, how you treat people and how society treats criminals should be kept separate. No - That was old testament justice. Jesus overturned Old Testament law that allowed retributive violence. Yes - Spiritual Law cannot be broken - every last remaining debt must and will be paid back. No - In that case, he will eventually pay for his crimes, regardless of whether he is executed or not. Yes - Look at Romans 13, Paul-Acts 25, Luke 23 - Wrongdoers should not seek to escape death, Fear the one who is in authority - carrying out God's wrath, We receive the due reward of our deeds. No - Look at Romans 12:17, Romans 12:19 - Don't repay evil with evil, and leave vengeance up to God. No - Law's are written by men, have loopholes, inconsitiencies, etc. Yes - Don't bring religion into this matter, punishement should fit the crime exaclty. No - In that case, leniency should be shown because every single circumstance is different. The murdered can, to some degree, contribute to their own death. Yes - No single person has authority to kill someone, its society that has determined his end. No - But we, as a group, have been given the decision whether he lives or dies, not society. Yes - Government Prosecuter says to execute him. No - Government Prosecuter is a bit over zealous, has been wrong in the past and corrupt and sinful, God says to rebuke sinners . Yes - Murderers are 100% guilty without a doubt. No - System is flawed and the innocent may and have been executed in the past. Yes - Sending them to prison, they can still harm others. No - Sending them to prison, they can do no more harm in solitary confinement. Yes - Kill 'em, they can go straight to hell. No - Sending them to prison gives them a chance to repent. Yes - The relatives of the murdered will be greatly relieved once exectuted. No - The relatives of the murdered have shown forgiveness and prefer solitary confinement for the murderer. Yes - On death row they are more likely to repent. No - No, repenting is initiated by God alone. Yes - Killing someone is punishment. No - Death is a release, not a punishment. Let them suffer in Jail. Yes - They are useless scum and sending them to prison is a holiday camp. No - They can be put to work in prison and give back to society. Yes - My morals and ethics deem execution necessary. No - My moral and ethics say send him to jail instead. Yes - He is just a nobody, no one's going to really care if he gets the electric chair. No - He's the son of one of the Panel members ! Yes - Execution is painless and quick. 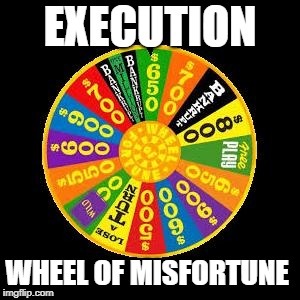 No - Execution is a tad Brutal........BRUTAL !!! Yes - The outcome is the 'right'. No - Two 'wrongs' don't make a 'right'. No - He is a human being. We must protect the sanctiy of life. Science has detected brainwaves. Yes - Those brainwaves are now of a questionable and corrupt nature and beyond rehabilitation. The GodandScience Panel, after careful deliberation, are still arguing to this point, on the convicted murderer's fate. Looks like he spun the wheel of misfortune.....and lost. Hanging is, in fact, a benign form of capital punishment. The old 'body in the acid bath' treatment. Buried neck deep near the ocean or around the ant nest in the hot sun (I reckon this is a hollywood movie thing). and lets not forget......THE MEAT GRINDER !!! Now, besides execution, I've been pondering what would be an appropriate punishment for a murderer who kills an "innocent" person. Paul mentioned that execution is a 'release' not a punishment. Firstly, you cannot bring the murdered person back to life so we need to find the an appropriate 'equalizer' as a penalty, ie., the next best thing to an Eye-for-an-eye. (ii) Works-based redemption (excuse the term). Redemption here means "repaying the debt". Part (ii)a - routine work in prison that contributes back to society - e.g. building life-saving equipment, etc..
Part (ii)b - regular donation of blood - to help save other's lives and the donation of organ(s) would also be appropriate. If a murderer kills multiple people, then multiple organs should be extracted from the murderer and given to those that need them (but only to the extent that he can still be kept alive and useful in prison). Remember the motto......"A living incarcerated murderer can be a useful incarcerated murderer".